Posted July 21, 2015 by Kelly McEvitt . When you think about online advertising, paid search is usually the first thing that comes to mind for marketers. But maybe people should be looking towards social media advertising instead. More and more brands are flocking to social advertising for the value and loyalty that it drives. Social media is more rooted in friendships and bonds, thus creating a stronger and more everlasting relationship with brands. The average internet user has 5.54 social media accounts. Social provides a number of platforms to reach potential customers and in an environment where they are comfortable. Looking to promote a event? Facebook might be the right option. Wanting to drive product sales? Instagram is a great platform to showcase your inventory. Social media offers something for everyone. Social platforms are able to gather a huge amount of user information, looking beyond general demographic and geographic data. Facebook, for example, allows you to target based on specific interests and purchase behavior. This advanced targeting provides a more personal experience for consumers and a better return for advertisers. Search advertising is all about clicks. Cost-Per-Click (CPC) rules all and it shows in your advertising spend. Social advertising is unique in that you receive the clicks you pay for, plus you get free impressions and clicks from social users sharing your ads. The more engaging the content, the more return you’ll see on your ad spend. You’ve no doubt seen the ads – You visit Nordstrom.com for some new dress shoes, find a pair you like but don’t buy them. Then you head to Facebook and those Cole Haan oxfords that you didn’t buy are in an ad on the rightrail of your screen. Conversion tracking is a powerful thing. And thanks to Facebook, it’s now easier than ever to implement. 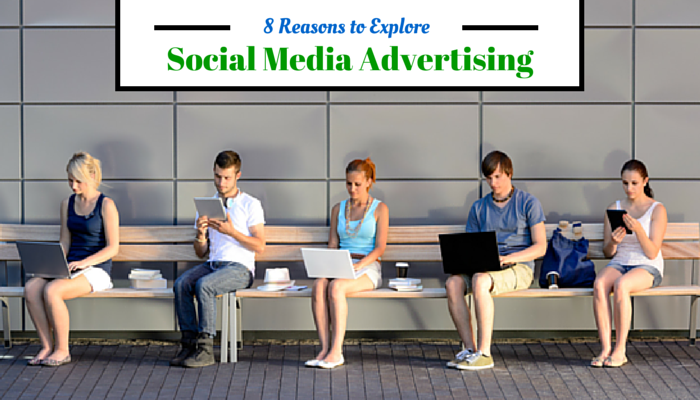 Consider likes, comments, and retweets the icing on top of your advertising cake. With most advertisers concerned with CPC first, interactions are usually seen as an added bonus. Social media allows brands to focus on driving traffic and conversions, while still concentrating on brand awareness through interactions. Great social media ads can foster meaningful engagement, connecting consumers with your brand and your products. On Facebook, a promoted post invites users to participate in a conversation and encourages them to share the content with other consumers. Social media provides a space for the public to interact with brands and in a way that’s non-threatening. Social media has evolved into a visual smorgasbord. It’s no surprise that visual platforms like Instagram and Snapchat are thriving. Consumers want to see images, and social ads are the perfect space to share products and promotions. On Pinterest, for example, brands can promote their pins and showcase their products in a comfortable environment for users. Soon the site will be launching Buyable Pins that will allow users to purchase products they see without ever leaving Pinterest. Advertising to mobile users has been the next big thing in advertising, and it’s no surprise that advertisers are looking to social media as their best option for mobile advertising. Mobile users are constantly checking their social accounts. 24% of teenagers with smartphones say they’re online “almost constantly.” Social advertising has become a great way to reach these users without much interruption. When looking at your advertising budget for the year, try allocating some spend towards social media advertising. Your brand will create a more valuable connection with consumers, using social versus search advertising. To get started with social advertising, contact us for a FREE marketing assessment. Questions? Connect with us on Facebook or Twitter!